UpRight, Inc. (“Upright” or the “Company”), is a leading manufacturer of aerial work platforms, including scissor lifts, boom lifts, manually propelled lifts, and aluminum scaffolding. UpRight has been manufacturing self-propelled scissor lifts since 1974 as an outgrowth of its leadership in the development and sale of aluminum scaffolding. UpRight sells its products through an extensive network of North American, European and other international equipment dealers and rental companies. UpRight’s customers rent, and to a lesser degree sell, its aerial work platforms to end users in construction, commercial, industrial and institutional markets. 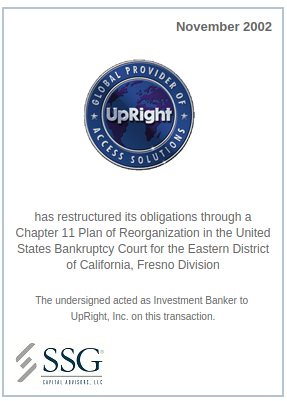 On June 12, 2001, UpRight filed a voluntary Petition for Reorganization under Chapter 11 of the United States Bankruptcy Court in the Eastern District of California, Fresno Division. The Chapter 11 was filed primarily as a result of an industry-wide downturn coupled with downward pricing pressure, increasing fixed costs and related debt obligations. The increased fixed costs and debt obligations were a function of UpRight’s expansion into the boom lift market and the associated construction of its Madera facility in late 1998. SSG Capital Advisors, L.P. was retained by the Company in July, 2002 as its investment banker for the purpose of finding an equity investor to fund a Plan of Reorganization and to assist the Company in restructuring in excess of $100,000,000 in debt obligations. After extensive negotiations with all creditor constituencies, and after a new equity infusion from an existing affiliate, the Company confirmed the Plan of Reorganization in October 2002 and emerged from Chapter 11 in November 2002.